Google Drive is launched by Google and providing a free storage of 5 GB to each user and 25GB $2.49 a month, 100GB $4.99 a month, 16TB $799 a year storage at very minimal cost compare to Drop Box, Box, Sky Drive.This is far more better than other earlier cloud storage services, Google also embedded features of sharing the same file to anyone, you can email the link of file and everyone will be able to access the file at the same time even size of file is big which not supports to email attachment. At the same time file can be shared with multiple peoples like in webinar or in any web meet. Google has given one good feature that is versioning of file, suppose you had uploaded one document in Google Drive and after later on you want to edit it for some correction, as you save it after correction the tool will maintain the version of same file and if you want previous version of the same file then also you can get it, so we can say apart from storing file on cloud server you can maintain versioning of any file and you can sleep well and feel safe data, your hard disk, phone can be damaged but the file on Google drive on safe for a long long time. 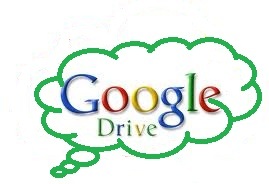 Google Drive has tremendous feature, almost they have covered Google Docs features as well, you can create also Spreadsheet, word document here as you were doing in Google docs, finally we can say Google Drive is combinations of two things one is Google Docs all Features and Storage of huge data on Google cloud server.You can store any files as audio files, video files, pictures, MS office files ( Excel, PPT, WORD), text files etc. You can upload your resumes and get from anywhere where you go. Easy way to upload a file just Drag and Drop.You can transfer your phone file on Google Drive as a one backup. You can register your email in Google Drive, Google will mail you as Google Drive will be ready for you.I hope you had enjoyed it and get an idea of new storage service Google Drive launched by Google and got a backup media of your files. This entry was posted in Google on April 25, 2012 by Yogesh Bajpai.